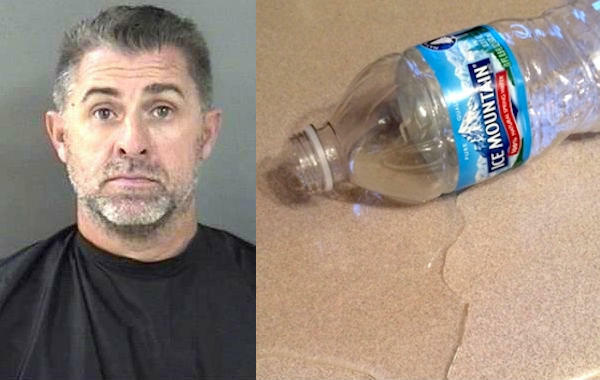 A man was arrested in Vero Beach after throwing a water bottle at his wife. VERO BEACH – A 48-year-old man was arrested in Vero Beach after he threw a water bottle at his wife. The Indian River County Sheriff’s Office received the call Thursday at 6:45 p.m. about a disturbance involving a water bottle at a home located in the 5000 block of 55th Avenue in Vero Beach. Prior to this incident, deputies left the residence a few minutes prior after the husband would not allow his wife into the home. When the deputies left the first time, the wife explained that her husband, identified as John Mitchell, told her “sh** is going to get really ugly now,” according to the report. While Mitchell was talking, he had a water bottle in his hand. He then threw the bottle towards his wife without warning. “[the victim] advised the water bottle hit her on her right foot,” the deputy said. The wife, who is pregnant, got scared because of her husband’s action and believed Mitchell was going to strike her again. The wife ran out of the residence and called law enforcement. Deputies made contact with Mitchell as he was cleaning up the spilled water on the floor. With a mop and paper towels in his hand, he told law enforcement that he tripped and the water bottle spilled everywhere on the floor. Mitchell’s statement was inconsistent with what the deputies saw. They observed water still on the victim. Mitchell was arrested and transported to the Indian River County Jail for striking his pregnant wife with a water bottle. He was charged with Felony Aggravated Battery on a Pregnant Woman.